This is not about pointing out or piling on, but rather understanding that it is often someone else's unfortunate situation that highlights gaps we have in our own processes. Perfect opportunity to test your own emergency systems, elevator or otherwise, and see if they measure up - not just to code, but to your own standards of care. I’m sure by now you’ve heard of the 53-year-old housekeeper that was trapped in an elevator for 3 days in a NYC townhouse unbeknownst to the homeowner, who was obviously not onsite, and unbeknownst to the rest of the world as well. She became trapped in the residential elevator on Friday and was rescued by FDNY Monday morning. An update to the story found the emergency elevator phone had been out of service, among other issues. If you haven't yet seen the news story, a member of the homeowner's family accompanied her on her transport to the hospital and she was reportedly dehydrated but otherwise in good condition albeit a bit shaken I'm sure. The only thing worse than experiencing an unfortunate situation yourself is having that same situation happen to someone you care about on your quote unquote watch. Most of us have been there in some fashion or another. Sometimes that's life and those are the cards we’re dealt but we should always walk away looking for how we can do better. Not to pick on New York City, but this is not a new topic. The Real Deal recently published a two-part investigative series on elevator risk in the greater NYC area. Elevated Risk (part one) covers specific accidents, lack of licensing requirements for elevator mechanics and missed red flags. Elevated risk: Malfunction at NYCHA (part two) focuses specifically on public housing, the pitfalls of falling short on elevator safety and plans announced in November 2018 to turn over the management of some of these apartment buildings to private companies. Both are worth a read. So, elevator entrapments... let’s take a poll, shall we? Ever been stuck in an elevator yourself? If not, you certainly know someone who has. Just ask around. For those of us who have, it was likely for a much shorter time frame than Ms. Fortiliza. Hopefully you were afforded the ability to communicate with a live person who could at the bare minimum let you know you weren’t alone in the world and also confirm that help was on the way. My own personal entrapment experience was at a major US airport and all of 20 minutes. This was nothing compared to a three-day-stint, but 20 minutes for me could be a lifetime for the next person. Thankfully my elevator had a working emergency phone. While the woman who answered my call for help didn’t seem to care all that much (no worries, my feelings weren’t hurt), I did have confirmation someone would be coming to help. What we’re all looking for in general, but especially in an emergency, is human connection. 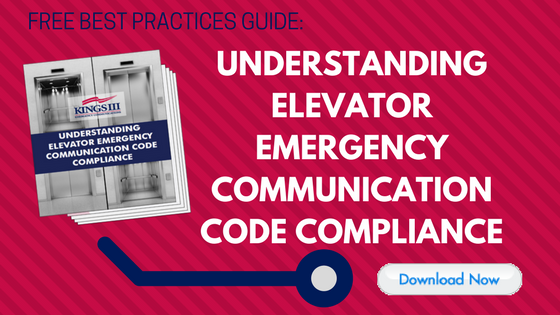 Elevator codes and standards are developed by multiple official bodies including the American Society of Mechanical Engineers (ASME) and the International Code Council (ICC) who develops the International Building Code (IBC). The pertinent code for ASME related to emergency elevator communication is the Safety Code for Elevators and Escalators A17.1/B44. The emergency elevator communication code for IBC is IBC Elevators and Conveying Systems, section 3001. Codes vary by elevator use as well. There are passenger elevators, freight elevators, construction elevators and grain elevators. The code for a residential elevator generally differs from a commercial elevator as the construction and use of residential elevators is quite different. While elevator code is nationally adopted in the U.S., the specific code year adopted by different states will vary. When new codes are published, the new code is only required in the states that adopt the new code year and only applies to new construction or elevator modernization. Some states auto-adopt, but not all. And then there are the almighty grandfather clauses sometimes simply referred to as safe harbor provisions. It's no secret our company specializes in heightened emergency monitoring for elevator and other emergency phones. We’re here to educate and hopefully promote the need to go above and beyond code compliance, whether you partner with us to do so or with another provider. Now, back to grandfather clauses and safe harbor provisions. Did you know that some commercial elevators don't have a phone in the cab at all? Insane, right? We run into it all the time. This happens when a building predates some code or standard going into affect and typically meets certain criteria. Sames goes for compliance with the Americans with Disabilities Act (ADA) for older buildings. While it's not always practical to make these changes, let's not ever set mere code compliance as the ultimate bar. Required or not, if reasonable for us to improve our life safety and emergency response systems, we should all do so. The bulk of our emergency phone monitoring sits in commercial office buildings, multifamily communities, schools and storage facilities. We encourage everyone to test their phones and to do so regularly. You must have a two-way communication system in the elevator and it must be hands free (ADA). The phone must ring to authorized personnel who can take appropriate action and who are available 24/7/365. It cannot ring to an automated answering system. The call must be answered within 45 seconds and if not, it must redirect to an off or on-site location. There must be a visual indicator such as a light that indicates the call has connected. The answering party must be able to identify your location, down to the elevator cab, without help from the elevator passenger. If there are two or more elevators, each cab must be able to place an emergency call simultaneously. Similarly, ASME is currently finalizing the 2019 edition of the Safety Code for Elevators and Escalators (A17.1/B44) to be published later this year. While not yet finalized or published, we are aware the update to Section 2.27 is focused on making the emergency communication system more accessible to those passengers with hearing and/or speech impairments. The changes center on a camera that can see the cab floor in its entirety (not necessarily video) and a digital messaging system to enhance communication with entrapped passengers (not necessarily two-way communication). Again it’s always important to note for these code updates that this code will ONLY apply to elevators permitted for construction or modernization (alteration) after the code is published and adopted by the state where the elevator is located. It will not impact existing elevators which are not undergoing modernization. 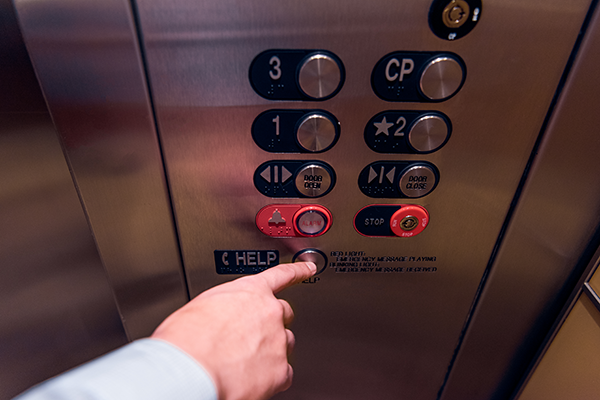 No time like the present – put your elevator phone to the test with our step-by-step instructions for comprehensively testing your elevator phones to check for specifics such as ability to locate the elevator without the help of the passenger. 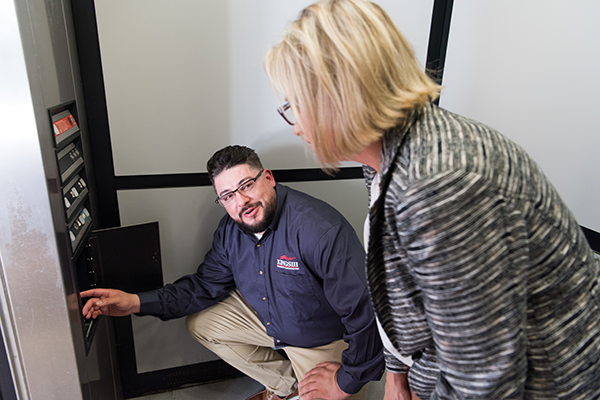 We encourage everyone to test their equipment and existing service monthly at a minimum and with the frame of mind that it were you, your loved one or your most important customer trapped in the elevator. Sure it passes code, but is it up to the standard of care you expect and your customers deserve? Time and time again we find ourselves chatting with property managers who really aren’t sure who answers their emergency phones or the exact protocol in handling. If that's you, this is to say you’re not alone. It's understandable this isn’t something most of us ever think about (myself included), until we do which is usually right about the time we need it or just thereafter. Elevator phones aren’t top of mind for anyone (trust me – it’s a rough life for an emergency elevator phone marketer). Passing inspection isn’t good enough. The ‘Who’ Matters. So you have a working phone that passes inspection... what else? Just because you’ve checked the phone box doesn’t mean you’re all set. Who’s on the other end of the line? How is the call handled? What training have the emergency operators received? Are they specialized in emergency monitoring or do they handle a wide variety of calls like a typical answering service? Will they stay on the line as long as a passenger needs them or are they evaluated by how quickly they can wrap up a call? What about risk and liability mitigation? Can responding parties provide medical instruction? All entrapment reactions are not created equal. One person’s inconvenient or irritating situation can be another’s trigger for a panic attack or escalation of existing health issues. In a recent focus group we conducted with the International Building Owners and Managers Association (BOMA), a former assistant fire chief turned commercial real estate investor and manager said it best. In recalling a story of an entrapped woman he helped to rescue, he explained, "an elevator is probably the safest place you could be. It’s a building within a building. The trouble is, no one is thinking that when they’re stuck in one." We’ve handled the full gamut with some calls lasting a short time and others 90+ minutes like a recent call we had with an elderly woman on oxygen trapped in a Florida elevator. It’s important that the team answering calls for help at your home or building can provide appropriate medical instruction and calm passengers when needed. Generic answering services have their place. This isn’t it. This great country of ours is the melting pot of all melting pots and that comes with an abundance of languages. Even for those who speak fluent English as a second language, in times of panic, will revert to their native language instinctively. It’s imperative that whoever is answering the call for help can provide that help to every one, every time and in the language it’s needed. Believe it or not, you don’t always want 911 to be your first call. Location Location Location: As mentioned above, code requires that responding operators be able to identify caller location without the help of the passenger. Is your current elevator phone monitoring capable of this? Put it to the test. False alarm issues: Think they’re common? So do we. You want a means of filtering these out as best you can in order to avoid dispatching emergency personnel when they aren’t needed. It’s a waste of their time, a hassle for you, and in many cases results in false alarm fines for multiple offenses. Not the side of the story anyone really wants to talk about, at least not publicly, but everyone knows it’s there and it’s all too common for our customers. How do you verify and back up event details for incident reports and potential litigation? Do you currently record and keep back ups of all emergency calls from your elevators? Are the emergency operators asking the right questions to verify health conditions and to confirm there is no need for emergency medical services? The care factor is everything. Ahhh, back to the feel good. No one likes emergencies – not for yourself, your loved ones or your clients. The care factor goes a long way in emergency response. It’s the human connection point we touched on earlier and that little extra really does matter. At the end of the day it’s just people helping people.